Finding Wonderland: The WritingYA Weblog (archive): Toon Thursday and Rock the Drop! Toon Thursday and Rock the Drop! Hey, did you Rock the Drop yet today in honor of YALSA's Support Teen Lit Day? It's not too late to download bookplates to print and paste inside your favorite book, which you will then sneakily leave for some lucky teen reader to find. Yes, you. Go! 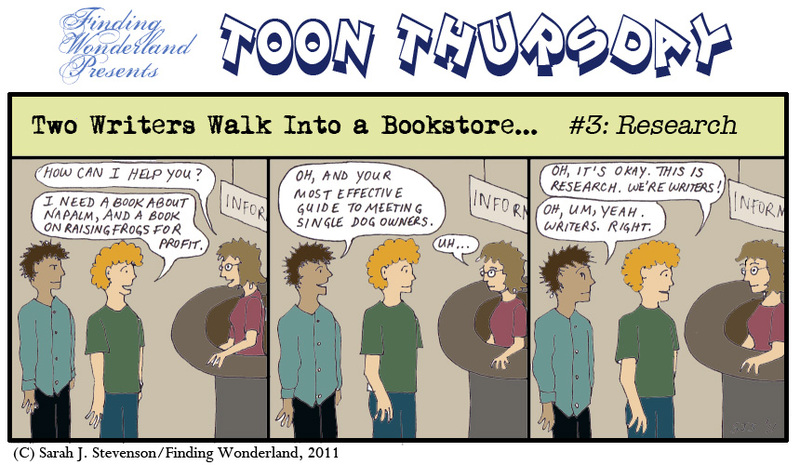 Aside from that, we present you with a brand-new installment of Toon Thursday. Click to view larger (i.e., if you actually want to READ the thing). Enjoy! Thank you! :) Rock the Drop, ladies! Happy Pesach! Happy Easter! Happy Spring! If I were in charge of Sesame Street shorts? "Well, all kids like a bit of gore, really." Thursday Bits: Are You Ready to Rock...the Drop?